The garden at Elsfield Manor is a good example of the layers often found in a historic landscape; layers which the garden historian must untangle. 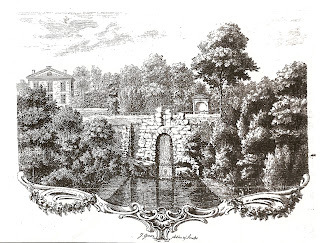 The first designed layer of the garden at Elsfield Manor is from the eighteenth century landscape of Francis Wise. He was the first librarian at Radcliffe, a passionate but ultimately second-rate scholar and a curmudgeon who once locked the dean out of the library. The antiquarian’s paradise he created at Elsfield was visited and remarked upon by Dr. Samuel Johnson (he of the dictionary). The second layer, which fortunately retained features of the first, was the Edwardian style garden of John Buchan, Scottish novelist, Governor General of Canada, and first Baron Lord Tweedsmuir, who lived in the manor house from 1919 to 1940. The garden subsequently was allowed to become quite overgrown, but some historic features are still visible. It is now in private hands, and renovation is hoped for. In this little spot, of a few acres, you was surpized with ponds, cascades, seats, a triumphal arch, the tower of Babel, a Druid temple, and an Egyptian pyramid. Those buildings were designed to resemble the structures of antiquity, were erected in exact scale and measure, to give, as far as miniature would permit, an exact idea of the edifices they were intended to represent. The Druid temple would have been a scale model of Stonehenge, which had recently been accurately mapped by William Stukeley, with whom Francis Wise was acquainted. The tower of Babel was probably a ziggurat and later a Chinese pagoda was added to this antiquarian's Disneyland. 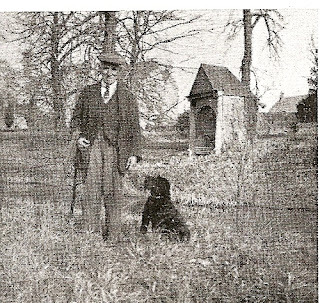 Unfortunately only one of the temples is still in place, sitting ghostily beside the pond and shown above in an engraving commissioned by Francis Wise, a photograph from the time of John Buchan, and at the present day. Elsfield remains an rare example of a non-gentry eighteenth-century garden, that of an academic who expressed his passion for the antique in the landscape, and one of its most important features--the view of Oxford's dreaming spires--was beloved by both Wise and Buchan and still is cherished today. OMG - you're doing the thing I've been looking for as a career! I have an undergrad degree in History & toyed with going for a grad degree. I think I'm interested in garden history because I grew up on land that had been part of an estate with a wildflower garden, the remnants of which became my playground & enchanted forest. Thanks for the fascinating glimpse into this garden.